Kuala Lumpur-Singapore has claimed the crown as the world’s busiest air passenger flight route topping the OAG Top 20 Busiest International Routes rankings with 30,537 flights in 12 months to February 2018. Hong Kong-Taipei placed second, Jakarta-Singapore (third), Hong Kong-Shanghai Pudong (fourth) and Jakarta-Kuala Lumpur completed an all-Asian top 5. 14 intra-Asian routes were ranked in the Top 20 list; 8 in North Asia, 4 South-East Asia and 2 between North and South-East Asia. 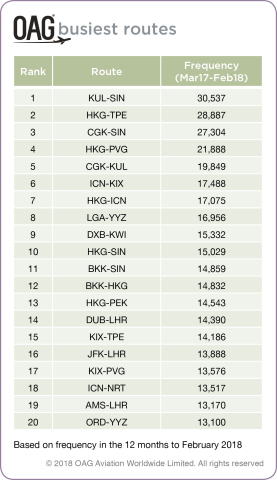 Hong Kong is busiest Asian airport hub featuring in 6 routes, Singapore in 4, Kansai and Seoul Incheon in 3 each. Five Asian airports, Kuala Lumpur, Bangkok, Jakarta, Taipei and Shanghai Pudong, featured on 2 of the global routes. The highest on-time performance (OTP) among Asian routes was Kansai-Taipei with 83%, followed by Bangkok-Singapore (80%) and Incheon-Kansai (78%). All 8 Asian routes feature at least 6 competing airlines; Osaka-Taipei route is operated by 11 airlines. By contrast, more mature European and North American routes like Dublin-London Heathrow and Chicago-Toronto show 4 competing airlines. Also note-worthy is the relatively high ratio of low-cost-carriers in operation, with five city pairs counting over 40% LCC penetration. Published annually, OAG’s Top 20 Busiest International Routes are calculated by analysing jet aircraft frequencies on international flight routes in the 12 months to February 2018. These are the world’s busiest trunk routes in terms of the volume of flights that operate on them.